3. Infibeam – has a striking resemblance to Amazon.com’s website with a product offering that covers books, movies, electronics, gifts, etc. FlipKart has seen traffic triple in the last year and Infibeam has seen it double. The graphs are certainly beginning to show that magic “S shape” but the scale is relative, so its hard to tell if they are just growing off a very small base. I wanted to compared the interest in “Flipkart” to other search terms including popular brands and publications. 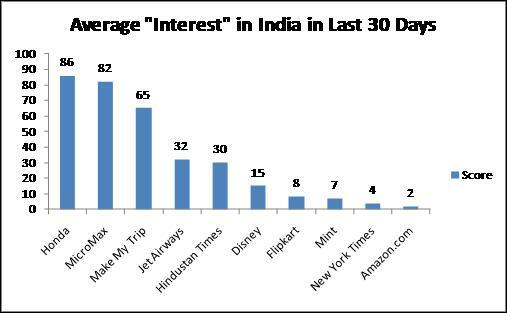 Flipkart is amazingly getting to 10% of the “interest” that a brand like Honda or Micromax commands online in India and one-half of that of Disney (which probably speaks more of Disney than Flipkart). Given the trends above it doesn’t seem like long before it will start to overtake some of these other search terms. So what does this mean? Clearly this is not bullet-proof evidence but it does show consumers are beginning to engage and trust in online retail, and online brands have begun to form. Now’s the right time for an Internet-based start-ups in India – people who use the likes of Flipkart will be more willing to try other e-commerce websites. There’s clearly still a long way to go for online retail in India, but if you want to make a bet on online retail now is the right time to start learning. Bottom Line: India’s interest in Online retail is growing very quickly and some e-commerce websites are starting to build mass awareness.